London, 1971, 1st edition. 266 pp, 25 b/w photos. Hardcover with dust jacket. Near Fine. 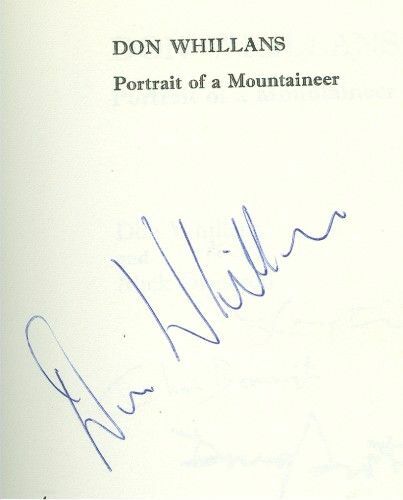 SIGNED by Don Whillans in blue ink on the half title page. 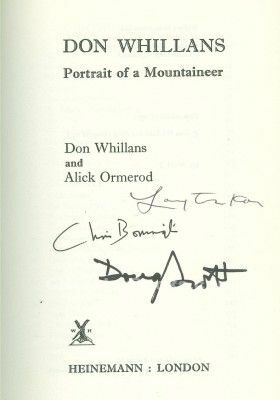 Also SIGNED on the title page by Layton Kor, Chris Bonington and Doug Scott. A leading figure in mountaineering in the 1950's-60's, who pioneered routes in Britain, the Alps and Himalaya, especially Everest and Annapurna. This is the climbing autobiography of legendary climber, Don Whillans. He had a colorful personality and an uncanny ability to crack hard route difficulties by using inventive moves and excellent, innate good route-finding. He pioneered many classic rock climbs in the UK, many with Joe Brown. He climbed several difficult routes in the Alps including the first ascent of the Fr�ney Pillar on Mont Blanc, Bonatti Pillar on Petit Dru, West Face of Petit Dru, Blaiti�re, Walker Spur on Grandes Jorasses, Eiger North Face attempt and rescue of another climber, several severe climbs in the Dolomites, near ascents of Trivor and Masherbrum in the Karakoram, climbs in Yosemite, first ascent of the Central Tower of Paine in Patagonia, Gauri Sankar attempt in the Nepal Himlaya, first ascent of South Face of Annapurna.